We at Delphina recycle not only to uncover the potential beauty or functionality of abandoned pieces, but because it respects past, present and future generations. We realise that market finds stand the test of time because they were built with that purpose in mind. Delphina aims to rescue and recycle pieces to help you demonstrate an individuality within your home not easily gained from mass produced objects alone. Our contrasting materials, textures, styles and pattern will add stylish soul and a unique depth to your home. Discover our eclectic range of pre loved vintage finds, they have been sourced from markets all over Europe so we can offer you an abundance of authentic vintage retro, collectable and unique pieces. 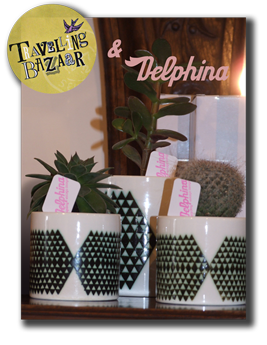 Delphina can offer you books, ceramics, hand embroidered art work, glassware, homewares, kitchenware, money boxes, tablewares, textiles, toys and tins. Our homemade section offers you a beautiful range of handmade cushions, and organic lavender filled hearts all designed with exclusive vintage fabrics we have recycled.